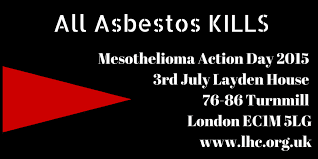 John's Labour blog: London Mesothelioma Action Day July 3 2015 "Banned But Not Gone: All Asbestos causes cancer"
London Mesothelioma Action Day July 3 2015 "Banned But Not Gone: All Asbestos causes cancer"
The theme is "Banned But Not Gone: all asbestos causes cancer"
It will take place at Layden House, 76-86 Turnmill Street, London EC1M 5LG. Release Doves at 10: 40 outside Farringdon tube near Cross Rail site. Closing remarks by Pete Farrell, Chair London Hazard Trust Board. Hat tip Phil (and Lenin). In 2013 as a local Councillor and trade union safety rep, I spoke at the action day which was held in Stratford Town Hall.